Welcome to J.A.M. (Just Ask Mike), a weekly column where Mike Sokol answers your basic electrical questions. If you’re a newbie who’s never plugged in a shore power cord (or ask – what’s a shore power cord? ), or wonder why your daughter’s hair dryer keeps tripping the circuit breaker, this column is for you. Send your questions to Mike Sokol at mike (at) noshockzone.org with the subject line – JAM. We just returned from our initial Spring Wake-Up Trip. The RV Park we stayed at was exceptionally nice. At any rate, when I went to hook up to the pedestal, all the breakers were in the ON POSITION! Why do RVers leave the breakers on when they leave the campground? Thought you should maybe mention someplace down the road for RVers to make sure they turn the breakers OFF before they disconnect their power cords. That’s a great suggestion, so here it is. I’m not going to get into the psychology of “why” RVers do certain things, except to say that perhaps ignorance is bliss. So thanks for helping me to educate everyone. The problem with plugging and unplugging your shore power cord while the pedestal circuit breaker is on is actually twofold. First, the American- (NEMA-) designed plugs we use in our houses and RVs are not totally safe for plugging into a live outlet. As you can see from the picture, it’s possible for your fingers to slip into the gap and touch the live contacts before the plug is totally seated. 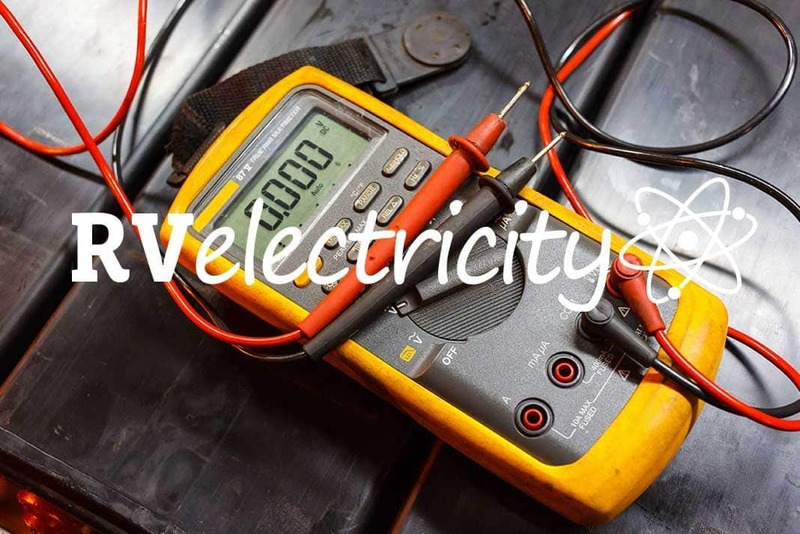 That can result in a painful shock (or even electrocution – death from shock) if you’re standing in a puddle of water and make contact with a live wire. This suggests that it’s doubly important to turn off the pedestal circuit breaker before plugging or unplugging your shore power cord-set from a pedestal outlet in the rain. And we’ve all had to hookup or disconnect shore power in the rain, haven’t we? Secondly (and just as important), plugging and unplugging your shore power cord while the pedestal breaker is on will induce arcing from the current trying to jump the gap in the contacts. This usually creates a bunch of pretty sparks which are actually tiny bits of your metal contacts being super-heated and burning up like tiny meteorites zipping through the atmosphere. Doing it once or twice is no big deal, but doing it hundreds of times will cause a reduction in the contact area of your plug and receptacle. And that reduced contact real estate will force all the current through a smaller surface area, resulting in plug heating. Plus this constant bombardment of tiny hot spots in the contacts will result in oxidation (rust) which will increase the electrical resistance and contribute to even more heating of the plug. Eventually you’ll need to replace your RV’s shore power cord-set, which ain’t cheap! You want to inspect your shore power plug regularly to make sure it’s shiny and bright like the one in the picture above. I have a hypothesis that constantly plugging and unplugging shore power connectors with the circuit breakers on (and under load) contributes to the number of obviously overheated and visibly burned shore power plugs, especially the 30-amp versions. Also remember that this plugging and unplugging under load is wearing out the contacts in the pedestal outlet as well. And that overheating probably contributes to loss of tension in the contacts. I’m sure all of you have plugged into a pedestal outlet that seemed really loose. I’m suggesting the looseness is likely the result of overheating which reduces the tension on the electrical contacts, and this overheating probably started with contact arcing from the shore power cord being plugged and unplugged with the circuit breakers on. So, break the cycle of shore power contact abuse. ALWAYS make sure the pedestal circuit breakers are OFF before you connect or disconnect your shore power plug. Your contacts will thank you for it. OK, everyone. Remember that electricity is a useful and powerful force, so we all need to pay attention to safety precautions while using it. Helpful reminder for this newbie. Hope and need more baseline information to build on for a subject I know very little about. Thanks. Question- As a retired fire fighter we were taught to inspect breaker panels in the businesses that we inspected for life safety issues. We were taught that people that used their breakers to turn lights on or off basically negated the safety aspect of that breaker over time and it became only a switch. Is that true and if so do we do the same thing with the breakers in the RV parks we visit? Would it be better if a throw switch were placed between the power source and the breaker box? 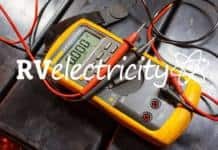 I would read a dozen of your articles each week, they are very informative and remind those of us that know some basics about voltage. amps, etc. but are a long way an expert, of things forgotten or not thought of, and a lot of the time, just plain don`t know. thank you for sharing your knowledge and experience with us. Wow. Thanks for this information. Either I did not know or maybe I simply forgot that you are supposed to turn the breaker off before removing or plugging in your shore power cord. I have a 30 amp outlet at my house and the breaker is in the basement. Not too convenient but I sure hope I remember to turn it off before the next time I insert or remove my power cord. If you can’t turn off the breaker at the pedestal, then turn off the main breaker in the RV’s power panel. The key is not to have a bunch of stuff power on or off while plugging in or out. Of course, you really need to be careful that you don’t get your fingers on the hot contacts as that’s very dangerous. I like the idea of the JAM format. Strawberry jam for me. The j.a.m. format seems OK. You will probably get a lot of questions about subjects you have already covered, but will be a good way to remind or reinforce people on the subject. That’s what I expect. The idea is that my regular RV Electricity column in Chuck’s Saturday newsletter will be for the more complicated topics, and J.A.M. will be more of a beginner’s series. I’ll put the really complicated articles in my RV Electricity newsletter published the last Sunday of each month. That way I can produce more content that won’t overwhelm newbie RVers, and won’t talk down to more advanced RV owners as well as RV technicians. Mike, I last replaced our house batteries 5 years ago – two 12V AGM “house” batteries bought from CW. They have been working OK and show ~13v at the panel. Now I’m seeing the “white stuff” at the negative pole of one battery. So I’m starting to research deep cycle 12v batteries. Can you suggest any resources that would help compare then and come to a decision on purchasing replacements? What do you have against whole wheat toast? At least for me, white bread has less taste, so it won’t interfere with the nuances of the jam (seriously). But multi-grain bread imparts too many additional flavors that get in the way of the taste of the jam (again, seriously). I think that whole wheat and pumpernickel bread are great for ham sandwiches, and even as a snack with just butter (don’t judge me, please), but pumpernickel and jam is a non-starter. i really do think about food a lot, so it’s good that I have a high metabolism or I would be in trouble. I just camped at a nice COE campground. When I got ready to plug in my 30 amp cord the breakers were off. When I plugged in the cord the contacts were so worn that the power cord fell out as soon as I released it. I used my “dogbone” and plugged into the 50 amp which was good and reported the problem. An electrician was there in a few hours and fixed the problem. I don’t want to think of the problems that could have come up If the breakers had been on when I plugged in.